These adorable all embroidered Grandparent shirts for Grandma and shirts for Mom are very unique shirts that Grandparents and parents will love. 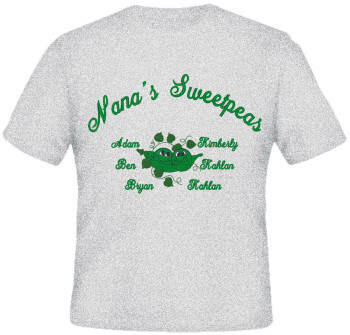 Create any Grandparent shirt you'd like such as Nana Shirt, Grammy Shirt, or Memere shirt. These grandparent shirts can include up to 12 names of your children or grandchildren and are available in tees or sweatshirts in sizes up to 3 xl. Whomever you order them for, these embroidered family shirts are loved by all! We can embroider accents and other special characters on your Grandma Shirt or Mom Shirt. Enter those requests in the Comments and Special Instructions Box during checkout.